The time is nearly here! 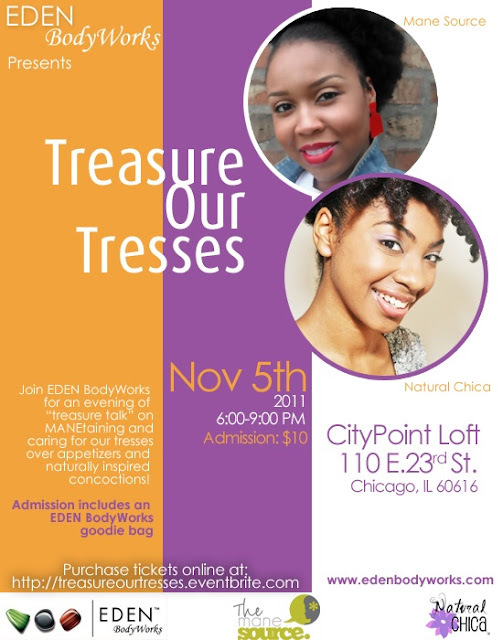 Tomorrow night EDEN BodyWorks will be partnering with popular hair bloggers The Mane Source and Natural Chica to bring “Treasure Our Tresses” to Chicago. The event will feature an evening of hair education, EDEN BodyWorks products, appetizers, and the opportunity to mingle with blogging favs The Mane Source and Natural Chica. Tickets are SOLD OUT so I hope you were one of the lucky ladies able to purchase yours. I'll be at the event, probably rocking a twist-out (or my latest obsession - - curlformers) and a red lip! If you see me there please say hello!!! Looking forward to seeing everyone tomorrow night.